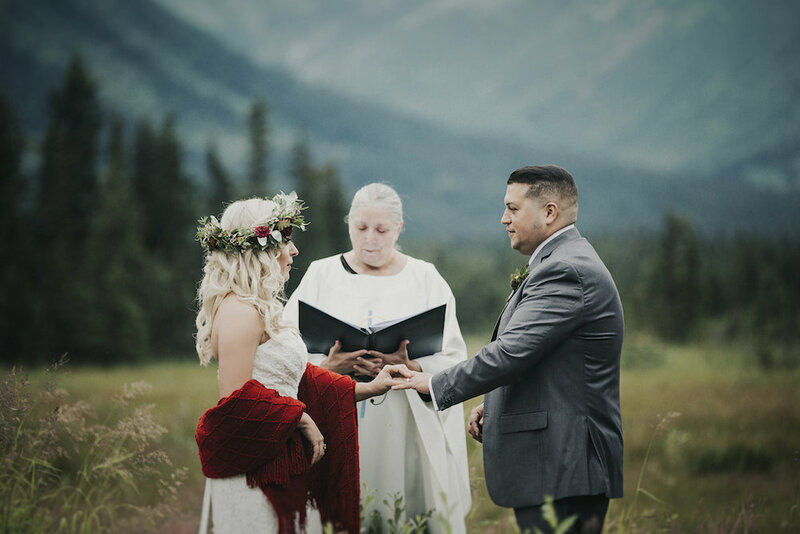 We've been posting so many glacier weddings lately that we wanted to take a break for green grass and gorgeous Alaskan meadows. Stacey and Johnny's elopement was too beautiful not to share! They came to Alaska from Florida with Stacey's sister and brother-in-law along to join in the fun and witness their vows. They were such a fun and laid back group and I remember them saying this was the most adventurous thing they had ever done. And we may have had a lengthy conversation about which state is more dangerous to live in between photos. I told them anywhere with alligators in your backyard scares me far worse than bears and I think they felt the opposite! It all goes to show perspective is different no matter where you live. Their day was overcast, but no rain showed and it was the perfect amount of lush green against the gray skies in the meadow where they said their vows. 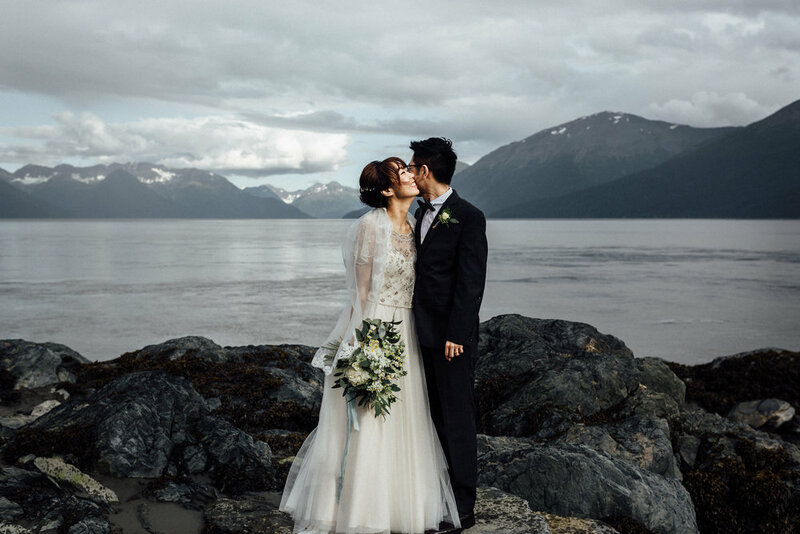 We wish you the best Stacey and Johnny and thank you for letting us be a part of your wedding day in Alaska! Say hello to the sweetest couple on earth! 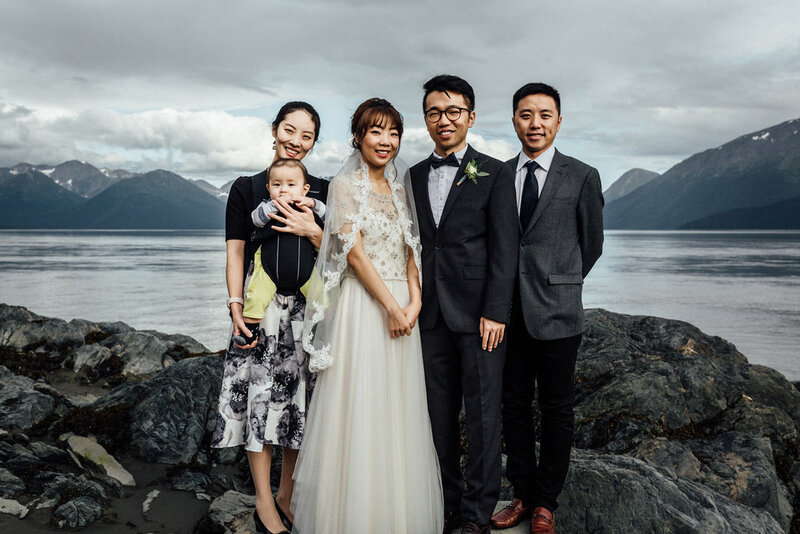 Feng and Shuren came all the way from New York to get married in Alaska. From our initial contact I could tell that these two were genuinely in love and just as genuinely excited to adventure in Alaska and elope while they were here. The Bride has a love for small creatures and was so excited to see as many animals as possible while here in Alaska. We incorporated the cutest bride and groom foxes into their wedding cake and spent time to spot eagles and squirrels on our hike to their elopement location. The Bride's sister and brother-in-law came along as witnesses, and they have just about the cutest baby I have ever seen in my life! Cute babies on wedding days just make me happy. I have to say this day was a treat and we are so honored that Feng and Shuren trusted us with the planning of their wedding day. Congratulations to these two!